The story takes place during an unbearably hot summer in the mill town of Shirley Falls, where the stifling heat reflects the uncomfortable relationship between highly-strung single mother Isabelle and her shy teenage daughter Amy. The semester before, Amy was caught having a sexual relationship with her much older maths teacher, Mr Robertson, who was drawn to her striking blonde hair and quiet intelligence. This part of the story is told through flashbacks, from their first meeting, to Amy falling in love with him, to the day when it came to an abrupt and embarrassing end. Mr. Robertson left town to avoid the threat of Isabelle calling the police, and Amy has not seen or heard from him since. In a fit of fury, Isabelle does something truly regrettable.What was already a fragile mother-and-daughter relationship now hangs by a thread. When this story begins, Amy has just started a summer job at the mill with her mother, and she describes their tense relationship as being joined by an invisible cord. 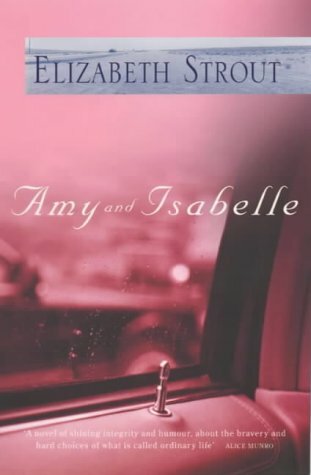 Through the viewpoints of both Isabelle and Amy, as well as some minor characters, the histories, secrets and longings of each character are revealed to us. Elizabeth Strout has a wonderful writing style, and she pays close attention to the tiny details that other writers might miss. These seemingly-insignificant actions and thoughts give us a vivid picture of each character and allow the reader to deeply relate to them. In one particular scene, we follow Isabelle as she plans for her boss (who she is secretly in love with) and his wife to come round to her house for dessert. Her anxieties of how this event will turn out, and all the little details about how she prepares for her guests, are at once funny and heartbreaking. There is a lot of humour in this story in the way that the characters interact and think about each other, but it often reveals a poignant truth about how each character really feels. This book is fairly slow-paced in parts, perhaps owing to the author's insistence on lingering on small details rather than quickly getting to the point. I personally felt that this was a good way of adding to the tension of a long and uncomfortable summer in a small town where not a lot happens, but readers who prefer fast-paced, action-packed novels will find this difficult to finish.